Start off your visit on the 21st (Fri): make a trip to Attukal Bhagavathy Temple and then relax and rejuvenate at some of the best spas. Here are some ideas for day two: enjoy the sand and surf at Lighthouse Beach, kick back and relax at Kovalam Beach, then admire the striking features of Sree Padmanabhaswamy Temple, and finally make a trip to Pazhavangadi Ganapathy Temple. To see ratings, other places to visit, photos, and tourist information, read Kovalam sightseeing planning tool . Hyderabad to Kovalam is an approximately 4.5-hour flight. You can also drive; or take a bus. While traveling from Hyderabad, expect little chillier days and about the same nights in Kovalam, ranging from highs of 36°C to lows of 29°C. Cap off your sightseeing on the 22nd (Sat) early enough to travel to Thekkady. Kick off your visit on the 23rd (Sun): look and learn at Green land spice garden, contemplate the waterfront views at Periyar Lake, then identify plant and animal life at Periyar Tiger Reserve, and finally take some stellar pictures from Chellarkovil Viewpoint. On the 24th (Mon), you'll have a packed day of sightseeing: revel in the low prices at Hachi Chocolate Homemade, indulge in some personalized pampering at some of the best spas, and then look for all kinds of wild species at Elephant Junction. To find ratings, other places to visit, and other tourist information, you can read our Thekkady road trip planner . Traveling by combination of flight and taxi from Kovalam to Thekkady takes 3.5 hours. Alternatively, you can drive; or take a bus. Wrap up your sightseeing on the 24th (Mon) early enough to drive to Alappuzha. Start off your visit on the 25th (Tue): admire the masterpieces at Revi Karunakaran Museum, then enjoy the sand and surf at Alappuzha Beach, and then tour the pleasant surroundings at Marari Beach. For ratings, traveler tips, photos, and other tourist information, use the Alappuzha road trip planner. Getting from Thekkady to Alappuzha by car takes about 2.5 hours. Other options: take a bus. In June in Alappuzha, expect temperatures between 36°C during the day and 28°C at night. Cap off your sightseeing on the 25th (Tue) early enough to travel to Guruvayur. Start off your visit on the 26th (Wed): contemplate in the serene atmosphere at Mammiyur Mahadeva Kshetram, admire the landmark architecture of Guruvayur Temple, then take in the spiritual surroundings of Venkitachalapathy Temple, then take in the spiritual surroundings of Parthasarathy Temple, and finally contemplate in the serene atmosphere at Punnathur Kotta (Anakkotta). To see more things to do, traveler tips, other places to visit, and other tourist information, read our Guruvayur trip itinerary builder . Traveling by car from Alappuzha to Guruvayur takes 4 hours. In June, plan for daily highs up to 35°C, and evening lows to 28°C. Wrap up your sightseeing on the 26th (Wed) to allow time to travel to Kannur. 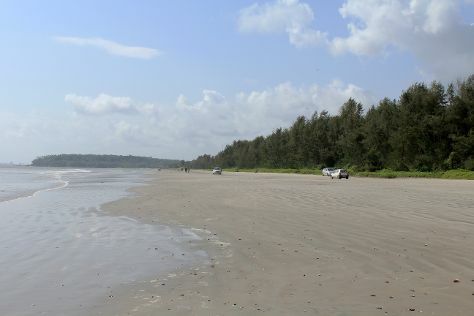 On the 27th (Thu), stroll through Choottad Beach, relax and rejuvenate at some of the best spas, and then enjoy the sand and surf at Muzhappilangad Drive-in Beach. Keep things going the next day: kick back and relax at KIzhunna Beach, then enjoy the sand and surf at Ezhara Beach, and then kick back and relax at Azhikkal Beach. For other places to visit, where to stay, and tourist information, read our Kannur driving holiday planner. Drive from Guruvayur to Kannur in 5.5 hours. Wrap up your sightseeing on the 28th (Fri) early enough to travel back home. Start off your visit on the 29th (Sat): see human ingenuity at work at Mattupetty Dam, then contemplate the waterfront views at Mattupetty Dam, then take in the dramatic scenery at Chinnakanel Water Falls, and finally admire the natural beauty at Tea Gardens. Plan a Pothamedu trip in moments using our itinerary builder. You can drive from Kannur to Pothamedu in 10 hours. In June, plan for daily highs up to 35°C, and evening lows to 28°C. Wrap up your sightseeing by early afternoon on the 30th (Sun) to allow enough time to travel back home.